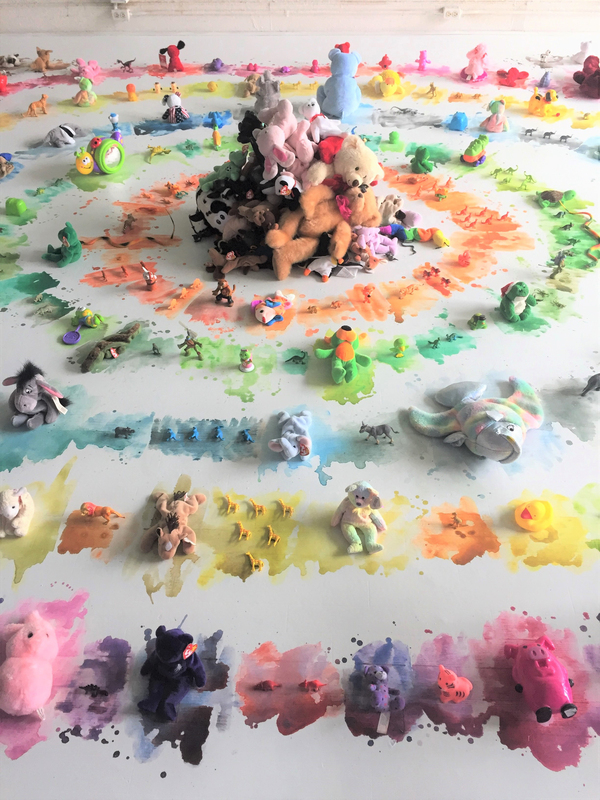 AMES, Iowa — “Toy with Animals,” an installation by Anna Segner, is on display April 11-30 at 301 Main St., a storefront in the Sheldon Munn Building in downtown Ames. Segner, an Iowa State University graduate student in integrated visual arts from Owatonna, Minnesota, completed the project as an independent study with Olivia Valentine, assistant professor of art and visual culture. The installation “grapples with the reduction of the animal to a toy,” Segner explains in her artist statement. “As children play with toys that reference animals, they learn to feel empathy for another species, yet they also displace the animals’ actual context, habitat, agency and behaviors. Child’s play forms perceptions and misconceptions about animals’ natural context that are carried through into adulthood,” according to her project description. “Toy with Animals” may be viewed through the window.